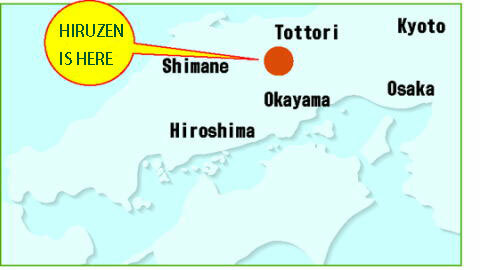 In Okayama at the source of the Asahigawa river, bordering Tottori Prefecture lies the Maniwa city. This beautiful city, some but surrounded by mountains lies at an elevation of 500 meters above sea level. It is famed for its nature and clean air, which has also brought notority to the agricultural products of the region. Come partake in the exciting activities that Maniwa and the surrounding areas have to offer. Whatever the season, you will find your time quickly go by. Jersey Cows munch on the grass of new green pasture field, and the Spring sings its freshness. The whole of Maniwa comes back alive again. This is one of the most busy times of the year, with planting and preperations for a new season. There is a different, more energetic step to the people living here, as they greet the warmth and brightness of the sun. A glorious time for man and beast alike. Jersey cows are originally from the small Anglo-French island in the English Channel called Jersey. It is said that once, when England could boast of an empire that never saw the sun set, the King of the time decided that the standard of the milk from his Jersey cows must also be the best, so that he could be said to rule over the best cattle too. Hiruzen Jersey Land In the large expanse of land at the foot of Hiruzen, many Jersey cows can be seen enjoying the rich green pastues of this agriculturally abundant area. It is from these Jeresy cows, whose delicious milk is being used to produce the special flavor of Hiruzen dairy products. The kind of dairy products produced here are not just milk for drinking, but also a white mould cheese, like the kind made in French Normandy, and a low heat pasturized yogurt, amongst other products. Morning on the Hiruzen Plateau starts early. The singing of little birds and the sound of mountain gorges provides nature’s alarm call. And wether morning or evening, the kind and soothing smile of Hiruzen’s three peaks create a wonderfully fantastical and peaceful atmosphere. As the morning sun slowly turns its force towards us, the chirping of birds becomes all the louder: the breaking of morning, and time to take to our wings. “where shall we raise our children...? Chosen as one of the top 100 nationwide, the mineral water spring bubbles up from the Salt Pan spring, and cools the humid summers of the Hiruzen Heights. A time to relax, a time to enjoy the beauty of this place so comfortably nested between the mountains of Hiruzen. A variety of outdoor pleasures can be enjoyed in these beautiful and tranquil surroundings, and ones imagination is the only limit. Traveling one kilometer west of Hiruzen Town Hall to the Nakaigawa River in Shimofukuda, one reaches the district’s main road at the intersection for Kofu Town and Chuka Village. Going two kilometers straight north of this point, one finds oneself within a national park territory, and at the source of a cold water spring called Shiogoma. The water source of the Shiogoma spring comes from the very center of the Hiruzen mountains, where it springs up from the valley of the 1122 meter middle peak. At approximately 12 meters by 5 meters, the small spring source of 60 square meters has the peculiar shape of a gourd. Reaching 1.9 meters at the springs deepest place, the water bubbles out from the source at a rate of .3 cubic meters a second. The velocity of the bubbling water and the temprature of 11 degrees Celcius remain constanr throughout the year. Close by the water source, one can find amongst other facilities, the Shiogama Lodge, a trout breeding center, and a camp ground. Many people visit this beautiful area to enjoy sightseeing, mountain climbing, and skiing. Chosen as one of the top 100 nationwide, the mineral water spring bubbles up from the Salt Pan spring, and cools the humid summers of the Hiruzen Heights. A time to relax, a time to enjoy the beauty of this place so comfortably nested between the mountains of Hiruzen. The nature is awsome, and can be taken advantage off in many ways. Climb the three peaks of Hiruzen and see the whole valley appear beneath your feet. There are numerous hiking trails, from beginner levels to the more advanced. It is up to you. The majestic Hiruzen Heights are located in the Daisen Oki National Park and make up the most expansive sightseeing resort in Okayama Prefecture. Jersey cows graze in their quiet pastures adding a pastoral touch to the surrounding scenery. A restaurant is available, but you can also enjoy barbecues. Horse riding is also available. It is also famous for the Shiogama cold mineral spring, selected as one of the 100 best waters in Japan. Take advantage of the numerous and scenic bicycle paths, that weave themselves throughout the area. Hiruzen, having nature and the environment in mind, was one of the first places in Japan to build extensive bicyle paths, that are now enjoyed by locals and visitors alike. Maps can be gotten easily, or be adventurous and explore for yourself. Whatever you do, it will be an adventure. 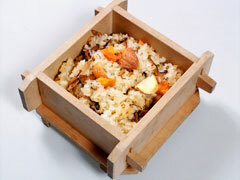 The Native Cuisine of Hiruzen: Hiruzen Okowa; steamed rice with red beans. A long time ago, there was a careless housewife living in a Daisen Temple. One day whilst cooking, this housewife confused red azuki beans with the garnish for sushi and accidentally stirred the red azuki beans into the steaming sushi rice. The unexpectedly delicious taste resulting from this mistake was given the name Okowa, and that is the story of how the Daisen Okowa got its name. Later on, someone suggested that a special Hiruzen variety of Okowa should be made. After a long hard day of playing in Hiruzen,Maniwa, come and enjoy the sooth ing effects of a natural hot spring. In Japan, this national pastime is not only enjoyed for the cleanliness it brings, but also for the spiritual regeneration it fosters in its practicioners. Yubara Hot Springs is one of three famous hot springs in Mimasaka. Yubara Hot Springs includes five hot springs-Yubara, Shimo Yubara, Taru, Maga, Goroku. Alkali simple thermal. It is known to have positive effects for rheumatism, neuralgia, skin disease. If you drink the water, it helps to counter gastroenteric disorder and diabetes mellitus. 【Suna Hot Spring】 Open-air bath of Yubara hot spring from the riverbed of Asahi River, one of the Okayama's biggest three rivers is now famous for being selected as best open-air bath in the western Japan area. There is no fence around the bath and men and women bathe together. However, wearing swimsuits is not permitted. People who take this bath can feel themselves at one with nature. Open 24 hours for free. 【Shimo Yubara Hot Spring】 Himawari-Kan at Shimo-Yubara Hot Spring has a bath for pet animals as well as separate open-air baths for men and women. 【Maga Hot Spring】 Maga Hot Spring is located in the southern most of Yubara Hot Springs and has an historical atmosphere. This bath is especially unique because its depth of 1.3 meters means that people must stand whilst taking a bath. 【Taru Hot Spring】 Many people who suffer from incised wounds or skin disease visit here hoping to cure their disease.Taru (foot) also means barrel and the name of this hot spring is derived from the story that the hot spring water here used to be sent in barrels so that injured samurais could cure their injuries. There are few experiences as wonderful and relaxing as a trip to the hot spring after a hectic day. © 20１１ 蒜山サイクリングセンター（ひるぜん農園）. All rights reserved.